It was a frigid morning in Ami’s village as he scurried outside to retrieve the morning water. A slapping thud echoed from the frozen stones lining the deep dark well as the bucket lowered into the black water below. It was nearly freezing on this autumn morning in the small Japanese village of Shirakawa but water for tea was a must. His fingers stiffened with each tug on the frosty rope as the heavy bucket made its way back to the rim of the well. An icy wind whipped over the peaks of the mountains and whistled intently as it made its way through the long narrow valley sending shivers down young Ami’s spine. Ami was now 15 and would soon be off to visit family in the South for the spring for several months but for now he still had to make it through the bitter winter that was just starting to make itself known. The front door flew open wildly as Ami burst through with a swinging bucket of icy water. “Careful Ami, you will make a mess for sure!” his grandmother crowed with her aging raspy voice. Grandmother was well into her eighties and was blind but still had senses as sharp as anyone half her age. She lived in her small dwelling of two bedrooms and a modest living space with an old iron stove that served as a gathering point for the family. It was not much but it was what Ami had always known and it felt like home more than any other place he had resided. Life in the village was not always easy especially this time of year when the weather began to change rapidly leaving you never knowing what to expect from day to day. Grandmother certainly needed help with things around the house and other daily chores such as shopping and gathering supplies for the winter. This is why Ami came each winter from his village in the South where he lived with his mother and father who were owners of a small general store. They had urged Ami’s grandmother countless times to move South with them but her stubborn ways and unwillingness to leave the home her late husband had built kept her firmly attached to the old property. The day moved on and began to warm ever so slightly. Grandmother called Ami in from his chores of cutting firewood and feeding the chickens to give him a shopping list with special instructions for the vegetables she needed to make her special soup. Ami washed his hands and dressed himself warm as he prepared for the chilling 3 mile walk to the local market. Grandmother’s house was high up the mountainside with a narrow dirt road that slithered down the steep rocks toward the heart of the valley. The valley was mostly farm fields with a main road that acted as a thoroughfare. Ami tied his boot laces snugly as he made his way out the door with the shopping list tucked neatly away in his front pocket. Ami was a bright young man who had a love of music. This was well known by the villagers who would often rejoice in hearing him sing lines from his favorite folk songs as he made his way past the farms and livestock stables. So off he went down the mountain with a song in his head that began to echo off the mountain sides as he jostled down the hillside singing aloud. He was making good time as he passed the last field on the right and could see the lantern swinging in the wind in front of the market ahead. Ami made his way from vendor to vendor with a smile gathering the vegetables, garlic and spices grandmother needed for her famous soup for which Ami had a special place in his heart. On days like this when the frost still hung on the eaves of the houses at mid-day grandmother’s soup was the perfect meal. As Ami walked out of the market with his goods tied in his canvas bag he shuddered as the sky turned dark and the temperature dropped by nearly 10 degrees. A storm front must be moving in he thought as he quickly made way down the valley road toward grandmother’s house. Turning from a walk to a brisk jog Ami attempted to get ahead of the storm as he feared it may soon begin an icy rain. Nearly a mile from grandmother’s house he felt the first frozen pellets strike his cold red cheeks. Faster and faster he began to run up the mountain road. At last through the fog and haze that was beginning to roll in he could see the smoke from grandmother’s fireplace and the bright blue door of her house. Ami was relieved to have gotten ahead of the rain as his pace quickened. As Ami approached the front door just a dozen or so feet from the first step of the porch a brutal piercing wind blew over the mountain peak behind grandmother’s house. The wind was so fierce that it stopped Ami in his tracks as he raised his hands to cover his face. Through watery eyes he could see bouncing down the mountain side through the forest what looked like a small gray whirlwind. Suddenly and without warning Ami’s legs gave way and he found himself face down on the icy dirt road as the vegetables for grandmother’s soup rolled out in front of him scattering all over the ground. Ami tried to take a breath but realized the air was frozen and thick. Now in a daze Ami felt an indescribable searing pain that shook him to his core. The frozen and agonizing ripping sensation moved up from his knees and struck him with a nauseating force. Ami attempted to scream but only a whimper escaped his throat along with a few bitter drops of stomach acid. Struggling to stand he was unable to find his balance. Crawling desperately toward the porch Ami turned sharply to find that his legs were both gone from the knees down. Looking behind him nearly 6 feet away he could see his shin bones sticking out of the top of his boots with a bloody thickened ooze embedded around them. In a blurry confusion he looked down at his legs to see that just below his knees there were two clean cuts that were stitched tightly with not a drop of blood to be seen. Suddenly with a primal force a horrid scream burst forth from his frozen lungs. Writhing and crawling toward the door Ami screamed in a terror filled agony. The front door burst open and grandmother scurried down the steps with her cain tapping desperately in front of her. “Ami, Ami!” she screamed. She made her way to the gasping noise in front of her and fell on her knees to reach out for her grandson. Ami pulled himself desperately into her arms as she held him with frail arms on the frozen dirt road. His breath sending a hot fog into the cold icy air. What just happened? To what could this tragedy be attributed to? This is a short story I have written to relay the timeless Japanese myth of the Kamaitachi. I have long been fascinated with Japanese culture and find their movies, anime, stories, myths and legends to be fascinating. The myth of the Kamaitachi which translates as sickle weasel tells the story of 3 weasels that ride on a dust devil or tornado. The weasels which are often referred to as brothers or triplets and are renowned for cutting off peoples legs. The first weasel knocks the victim down. The second weasel then cuts the legs of the victim off while the third weasel stitches up the wounds all in a matter of seconds. This myth has unknown origins within Japan but most certainly refers to an agricultural society and most likely makes reference to a religious or mythical omen dealing with the harvest. 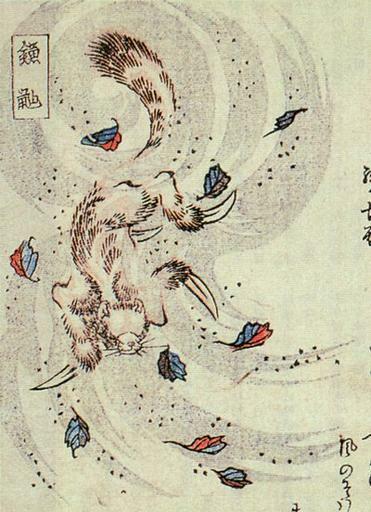 The Kamaitachi is but one of many strange and fascinating stories from Japan. Over the years the story of the leg cutting weasels has been the subject of Japanese films, anime and various other strange and captivating media. Japan will continue to a source of deep imagination and innovative brands of storytelling and folklore. Providing us with an ever growing source for terrifying and highly unusual tales and narratives with the Kamaitachi being but one of them. Jason Pentrail is an instructor, researcher, musician and author. Background image via Pixabay.com and main article image free use.